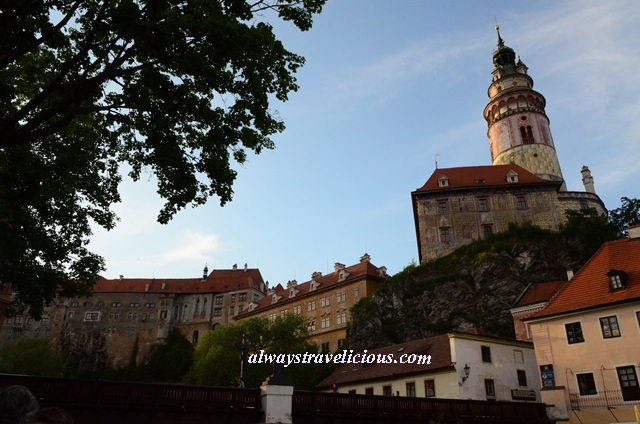 Two Marys Restaurant @ Cesky Krumlov - Always Travelicious ! The quintessential Bohemian Two Marys Restaurant (or U Dwau Maryi) is housed in an ancient building with two original murals that date back to the 1700’s. The restaurant is aptly named after the two murals which depict Virgin Mary, painted on the walls for protection. The restaurant’s red-framed entrance is charming with a gothic menu board. Like some of the restaurants I’ve seen in Cesky Krumlov, beautiful views tend to be hiding at the rear end of the restaurant, after passing the lobby and the indoor area. The view is simply fabulous. What can be better than dining by the riverside and right at the foot of the castle tower? I had my very first mead (or honey wine) at Two Marys and I was hooked (60 KC, about 2 Euros). I ordered mead without fail whenever I see it on the menu in Cesky Krumlov. The mead here is the strongest in alcohol content with a hint of sweetness, while the pungent mix of herbs including cinnamon and cloves really surprised me because it was my very first time trying spiced wine. I saw millet on the menu, something I had never tried before, so I ordered baked millet with beans and cabbages (145 kc, about 5 Euros). 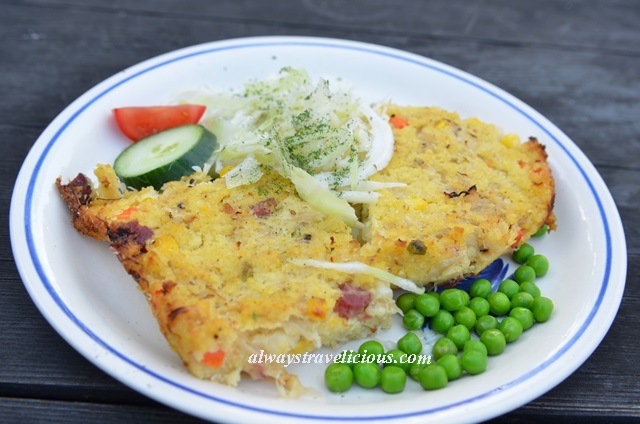 The millet is filled with sauerkraut, ham pieces and has the texture of a heavy muffin. Two Marys Restaurant’s menu is unique with its emphasize on traditional Bohemian cuisine. A lot of items looked really interesting including the Old Bohemian Feast – “chicken, smoked meat, millet, potato, salad”,the Kuba – “puffed barley with mushrooms and vegetables”, the Zahour – “sweet creamy dumplings with blueberry sauce” and the Medieval Buckwheat Gruel.